Twix was kind of a mystery. 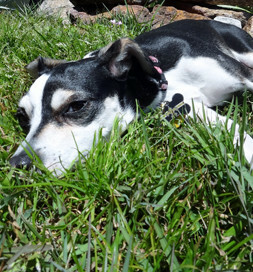 The Pates thought she was a terrier, but her legs just kept getting longer and longer, and people started asking if she was an Italian Greyhound. Twix flops down and rolls in the grass when he goes outside. “We didn’t know a lot about the breed,” Melissa Pate says, “but as we researched we saw that it was 100% her personality and she really started resembling one” as her legs grew. They had adopted Twix after seeing her on Petfinder, listed by SNIPSA in San Antonio, where they were living at the time. Melissa contacted the Humane Society of West Texas and offered to foster her if they couldn’t find her owner. As it turned out the dog was microchipped, but when the owners were contacted they didn’t want her back. “So we agreed to continue to foster her. “A few days later, after falling in love and watching her get along so well with our princess dog, we became foster failures.” Beignet was home for good, and it continues to baffle Melissa how someone could give up Beignet. The two dogs have become best friends. One game they engage in is what Melissa calls “playing Frankenstein,” where they wrestle by standing on their back legs and jumping toward each other with their front legs extended. 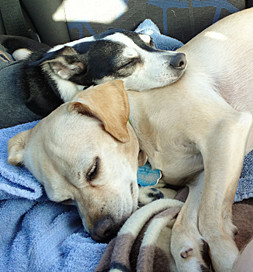 The Pates hope to adopt more Italian Greyhound rescues when they settle into a permanent home. “It’s just funny how we found everything we wanted without knowing that’s what we wanted,” Melissa says. Of course, they may find another sweet Beignet as well.